A man armed with a shotgun and smoke grenades burst into a newspaper office in the US city of Annapolis on Thursday, killing five employees in what police described as a "targeted attack." 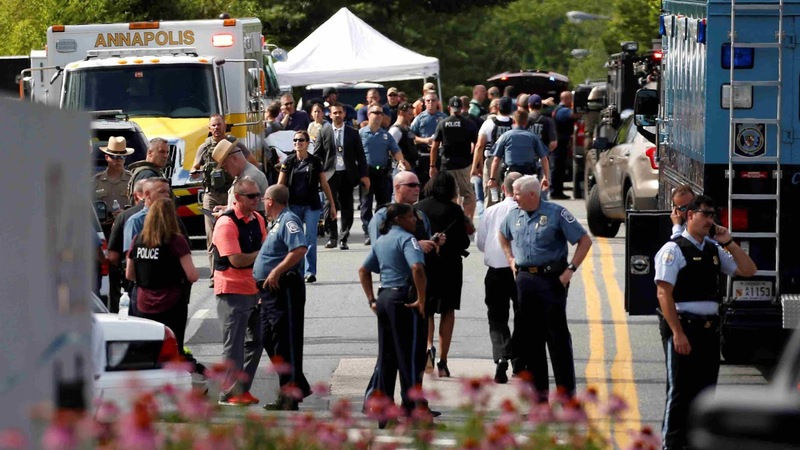 Officials said the shooting at the Capital Gazette was carried out by a white adult male resident of Maryland state who was being questioned in custody. The Baltimore Sun - which owns the Capital Gazette - identified the suspected shooter as Jarrod Ramos, who it said had a long-running dispute with the newspaper over a 2011 story "that covered a criminal harassment case against him." Police said the suspect is believed to have acted alone and there are “no further threats” connected with the attack. There were five fatalities and two superficial injuries, the acting police chief of Anne Arundel county, Bill Krampf, told journalists in Maryland's capital. He identified the dead as four journalists - Gerald Fischman, Rob Hiaasen, John McNamara and Wendi Winters - and sales assistant Rebecca Smith. Krampf said that police did not yet know the shooter's motive, but "we know that there were threats sent to the Gazette through social media." A reporter for the daily, which has roots dating back to the eighteenth century, tweeted a chilling account of how the "gunman shot through the glass door to the office and opened fire on multiple employees." "I'm in no position to speak, just know @capgaznews reporters & editors give all they have every day. There are no 40 hour weeks, no big paydays - just a passion for telling stories from our community," DeButts wrote. Chase Cook, a reporter at the newspaper, said the shooting would not stop The Capital - the local print edition - from going to press. The shooting was first reported around 2:40 p.m. local time.